Many crocheters are hesitant to try different crochet techniques such as Tunisian, Hairpin, and Broomstick. Sometimes this is because they think it will be too hard to learn, or that these techniques are the “ugly stepchildren” of crochet. I’ve done some Tunisian, but Hairpin and Broomstick scare me. Perhaps this book will help me and others get over that fear. 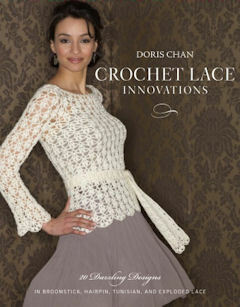 Crochet Lace Innovations contains 20 patterns using Tunisian, Hairpin, Broomstick, and Exploded lace techniques. Each chapter begins with a tutorial, followed by a garment section that provides templates to follow to help create patterns that fit and flatter. The book starts with an introduction by Doris Chan telling how she finally learned Hairpin and Broomstick lace and embraced the possibilities. Next, you’ll find out how to use the book itself. As mentioned earlier, each chapter begins with a tutorial to learn the technique, followed by some tips for success and several patterns to try using the technique. The Exploded lace technique isn’t as harmful as it sounds, but uses larger thread or yarn to “explode” the design into a larger piece. You’ll find plenty of patterns to practice on, including scarves, tops, vests, skirts, wraps, and dresses. Take time to follow the tutorials, practice, and don’t forget to swatch!